This month's Noteworthy Plant is dedicated to a strange plant malformation called a fasciated stem. An inquisitive student brought a large, fan-shaped stem to Professor Armstrong's office. The stem was from the sagebrush called mugwort (Artemisia douglasiana), a native California shrub that is common in San Diego County, from coastal valleys and mountains to the desert edge. Like most other species of sagebrush (and most shrubs in general), the stems of this species are typically cylindrical; however, the sample brought to Professor Armstrong's office was enlarged and flattened into a bizarre, fan-shaped structure quite unlike the normal stem. Although it was greatly expanded and flattened, the stem had normal, slightly aromatic leaves typical of this species of sagebrush. By the way, the common name of "mugwort" comes from a European species (A. vulgaris) used as a condiment (seasoning). The name is derived from the old English name for plant "wort" and a container "mug." The European herb MAY have been used as a flavoring in beer, or perhaps another beverage consumed from a mug. A severely fasciated mugwort stem (Artemisia douglasiana). The mysterious origin of strange growths on the stems, leaves, flowers and roots of plants has intrigued naturalists for centuries. Called "galls" or "hypertrophies," these tumorous (neoplasmic) outgrowths develop from rapid mitosis and morphogenesis of plant tissues and come in an astounding array of colors, shapes and sizes. Galls may be smooth, spiny or fuzzy, and resemble everything from marbles and ping-pong balls to dunce caps, saucers and sea urchins. Many galls provide the food and brooding structure for various species of insects, nematodes and mites which are deeply embedded in the plant's tissues. The plant's defensive reaction to this intrusive mechanical or chemical irritation is to isolate the toxins or activities of the invader in a tough, tumorous mass of tissue called a gall. The precise mechanism by which plants produce their unique galls in response to different species of animals is still being debated by cecidologists (biologists who study galls). Spined turban galls on the leaf of a valley oak (Quercus lobata) in California's San Joaquin Valley. The peculiar galls are caused by the cynipid gall wasp Antron douglasii. The leaf also has some minute jumping galls the size of a pin head. The exact cause of gall formation varies with different plant species. In the case of certain parasitic fungi and mistletoes, the host plant tends to produce a mass of woody tissue surrounding the infection. This is especially evident on the stems and branches of oaks where the specialized mistletoe root system (called haustorium) has penetrated the host tissue. Long after the soft-tissued mistletoe has died and withered away, the persistent gall remains on the limbs. Old patriarch oaks may have huge galls several feet in diameter, battle scars from mistletoe attacks many decades before. Some tropical mistletoes leave perfect attachment imprints on the host stem long after they have rotted away and fallen off. These club-shaped malformations of the host wood, intricately sculptured by the impressions of the mistletoe haustorium, are called "wood roses." They are a perfect cast of the parasite's haustorial attachment. In Mexico and Bali, wood roses are carved into all sorts of beautiful figures, including fish, birds and reptiles. These wood roses are not to be confused with the Hawaiian wood rose (Merremia tuberosa), from a yellow-flowered climbing vine in the Morning Glory Family. 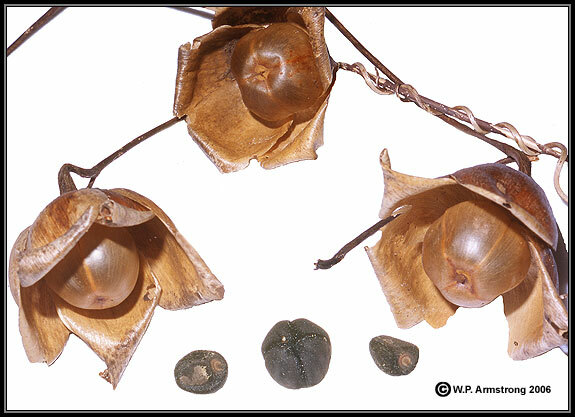 Known to Polynesian travelers as "wood rose," the enlarged, dried calyx surrounding the seed capsule resembles a lovely rose carved in wood and polished to a satiny-brown finish. Wood rose galls on a wood carving from Bali. The unusual galls are imprints (casts) of the haustorial attachments of a tropical mistletoe. Although their origin may vary considerably, fasciated stems may be an unusual gall-like structure caused by insects, mites or nematodes. Fasciations occur on a wide variety of plants in San Diego County, including sagebrush (Artemisia), chocolate lily (Fritillaria), evening primrose (Oenothera) and a tall roadside weed called mullein (Verbascum thapsus). It should be noted here that some fasciated stems may be a genetic malformation (as in certain cristate cacti). At this time the WAYNE'S WORD staff does not know the precise organism that caused the fasciation of our mugwort, but we are reasonably certain that it is not a genetic malformation. Armstrong, W.P. 1995. "To Be or Not to Be a Gall." Pacific Horticulture 56 (4): 39-45.